All-Pro Mechanical is proud to serve the Galesburg community! About Galesburg, MI - Happy to be your hometown Heating & Air Conditioning Contractor! Galesburg is located in Kalamazoo County, Michigan and has a total population of roughly 2,000. It is located along the Kalamazoo River and consists of about 1.45 square miles of total area. This town is also situated about ten miles from both Battle Creek and Kalamazoo, where dining and shopping can be found. The weather of this area typically consists of hot and humid summers. Winters are cold, and moderate to heavy snowfall can be expected. 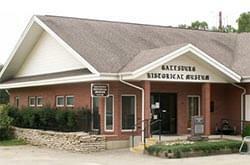 Galesburg is home to several attractions that may interest residents and visitors. The Hickory Ridge Golf Course is located in this community. Outdoor recreational areas include Crum Park and the River Oaks County Park. Other major attractions are located in nearby Kalamazoo, and these include the Kalamazoo Institute of Arts and the Kalamazoo Valley Museum.